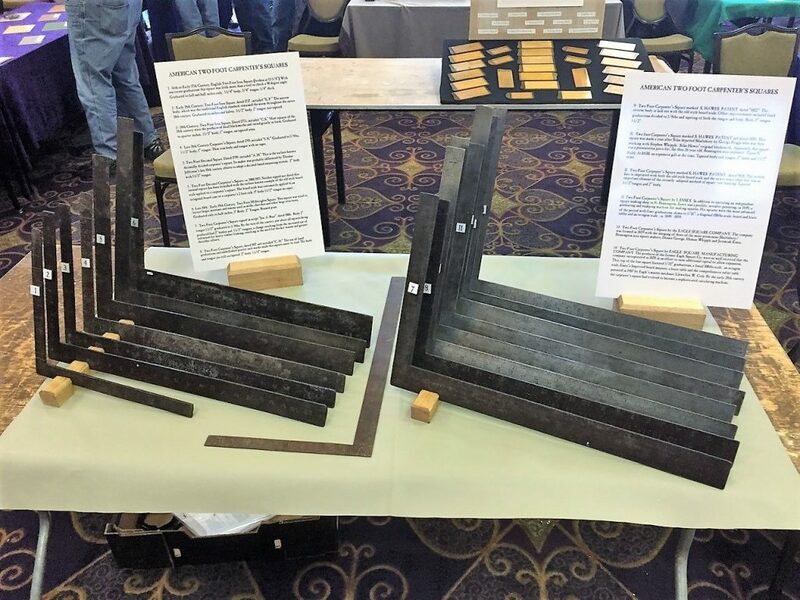 Ted Ingraham who hails from Ferrisburg, Vermont, displayed a wonderful collection of early 17th and 18th century carpenter’s framing squares. Ted is an authority on framing squares and has done extensive research on the topic. His display (See Figure 5.) 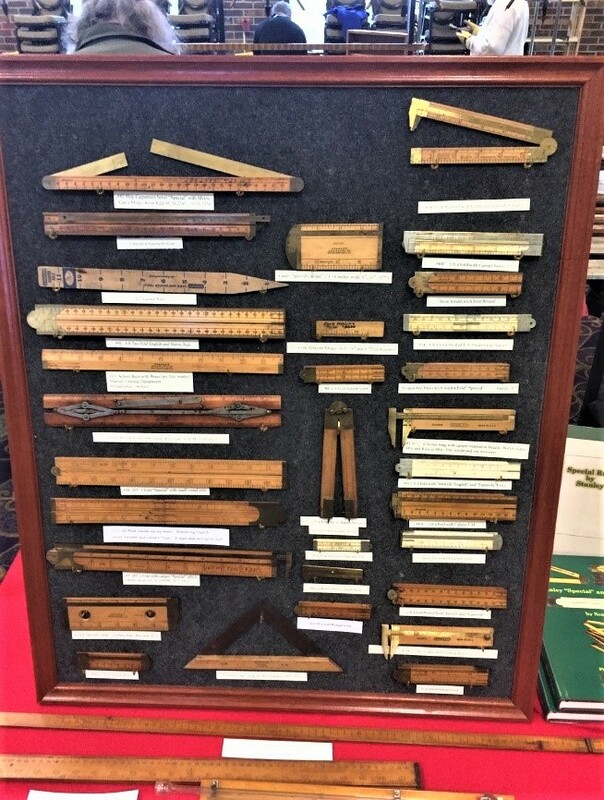 detailed the evolution of the framing square from the early 17th century thru the early 20th century including several examples from the Eagle Square Company of South Shaftsbury, Vermont. The Stanley Rule & Level Company acquired the Eagle Square Company in 1916. Most of the squares in Ted’s display were dated, with the earliest one is dated 1737 along with the maker’s initials. 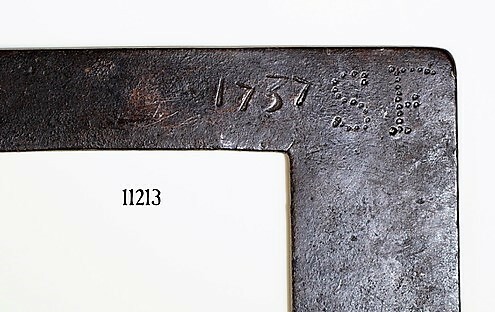 He also displayed an early 17th century English framing square in which the full inches and half inches are laid out on the main body of the square with no markings on the tongue (the short arm of the framing square) of the square which was common on squares from that time period. This square is marked with “dog bones” which refers to the shape of the number “1” digits on the square (See Figure 7. ). The “1” has an arching serif on the top and bottom of the bar. This form of the digit fell out of use in the 1650’s so Ted believes this helps date the square to the first half of the 17th century. John Harkness of Salem, Massachusetts has been a rule collector for over 35 years and is well known for his discernment in acquiring rules of only the best quality. When John’s rule collector friends find a rule in absolute mint condition, they refer to the rule as “Harkness quality”. 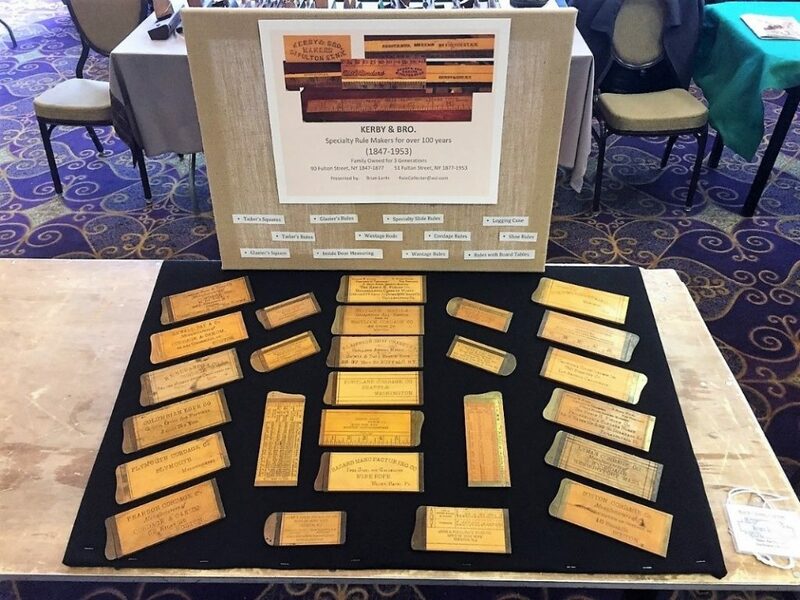 John’s theme for his exhibit was “Lumber & Board Rules” and included 35 rules from different American makers including Stanley, Haselton, Belcher Brothers and Chapin-Stevens all in mint or near mint condition. 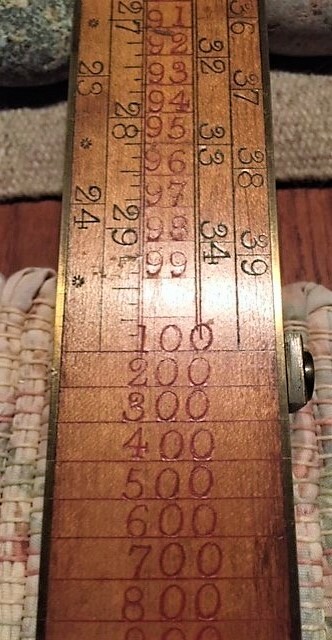 Johns favorite rule on display was a brass bound satin wood board scale with a built-in tally that is unique amongst board rules (See Figure 8.). The unsigned rule has brass nuts that move along the beam keeping a running tally of the board feet measured up to a total of 1000 board feet. 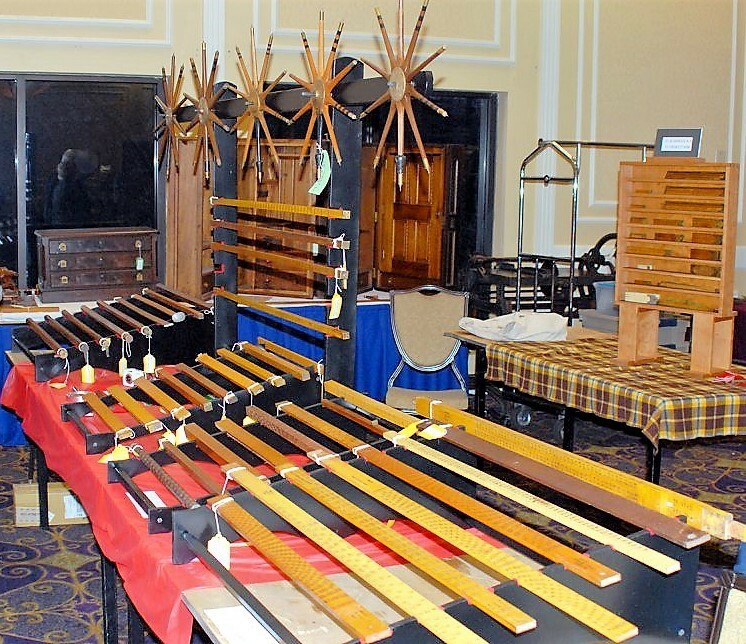 Mark Levanway of Athens, New York, a woodworker by trade, has had a keen interest in antique woodworking tools for over 25 years. Mark has a strong interest in E.A. Stearns rules that were made in Brattleboro, Vermont. Mark made a beautiful display case just for this event and it housed 25 E.A. Stearn’s rules represented the diversity of the Stearn’s rule making operations. Mark’s favorite is a Stearn’s No. 47 ivory and German silver 4-fold rule with arch joints. Phil Cannon of Oak Lawn, Illinois is well known by rule collector through his website www.pactu.com. Phil’s website provides a comprehensive list of American rule makers and always has new and interesting information to share. It’s well worth your time to pay a visit to Phil’s website. Phil’s theme for the showcase was “Early Hook bound Rules from Massachusetts” (See Figure 10). Phil had several examples of early American rules with hook bindings made by Stanford & Rook, Anthony Gifford, William H. Rook, and Joseph Watts. Phil explained that the hook binding’s purpose is to prevent the brass bindings from breaking away from the rule. A square hook is bent into the brass binding and set into the wood as a means of securing the brass binding to the body of the rule. This feature is seen only on rules produced in Massachusetts prior to 1850. Bill Youart of Stephensport, Kentucky describes himself as an “avid” Stanley rule collector since 1988. 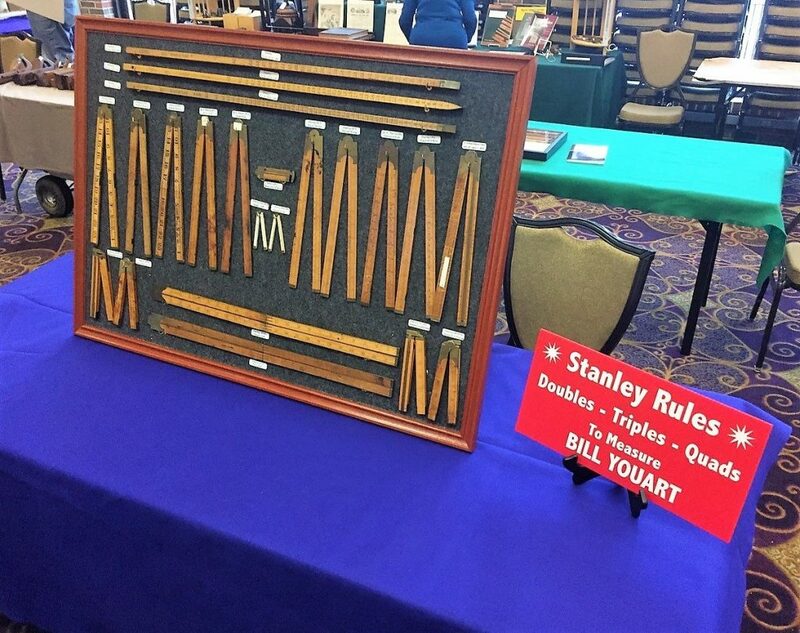 Bill brought a fascinating display of Stanley rules he titled “Doubles, Triples, and Quads”. The title refers to rules produced by Stanley Rule & Level Company with two, three, and sometimes even four variations for the same Stanley catalog number. Bill explained that Stanley rules with specific catalog numbers changed over the years they were in the Stanley line of rules. These rules remained the same in terms of length, width, thickness and the numbers on the rule, but other changes were made to the rules over the years. Minor changes might consist of changes to the brass hinges to major changes such as the addition of brass slides and calipers. The Stanley No. 83 two-foot four-fold rule is a great example of what Bill calls a “quad”. When the No. 83 was first introduced it had a 6” brass slide and 1/10th of an inch graduations along the thin edge of the rule. By 1900 the rule was listed as catalog number 83¼ and had a square arch brass hinge, no graduations on the edge and a 6” brass caliper rather than a slide. Then Stanley introduced the No. 83½with a half round edge joint, architect’s scales on the legs and 1/10th of an inch graduations on the edge. In 1910, Stanley introduced the No. 83C with brass round arch joints, a brass caliper and no graduations along the thin edge. The Stanley No 83 rules were manufactured by Stanley from the 1870’s up until 1920. Of his many favorites Bill particularly likes his Stanley No. 0 and No. 00 six-inch two-fold ivory carpenter’s rules. As anyone who has ever visited Ted Hopkins tool museum in Manchester, Vermont can attest, Ted is a collector of all things Stanley and almost any other tools that catch his eye. 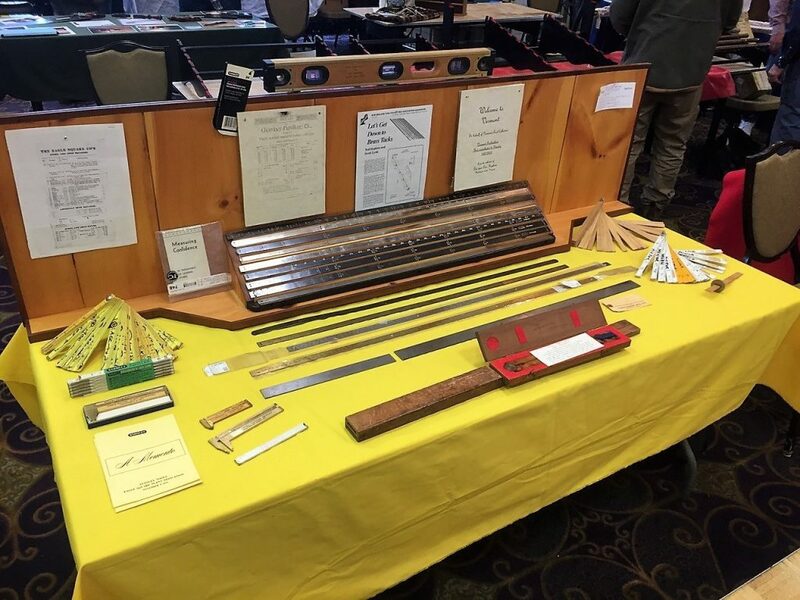 Ted’s theme for the Rule Collector’s Showcase was a display of rules made by the Eagle Square Company in South Shaftsbury, Vermont. While well known for making framing squares, Eagle Square also made rules. Ted had a wonderful display of beautiful mint condition Eagle Squares rules including wooden zig-zag rules, maple rule blanks, and finished rules with yellow paint. His display also included some brass, stainless steel, and nickel plated metal rules in various widths called counter measures. Ted explained that these rules were used in drapery and millinery shops selling fabric and ribbon in yards and fractions of yards. They were often fastened to a counter top or a board. he other possibility involves country stores that sold fabric. To make measuring the fabric easier, brass tacks were hammered into the rule at common intervals – a yard, half-yard and quarter-yard. One theory about the origin of the phrase, “let’s get down to brass tacks” referred to the shop owner using the brass tacks to quickly measure the cloth the customer requested. These rules were made prior to 1916 when Eagle Square was sold to Stanley. 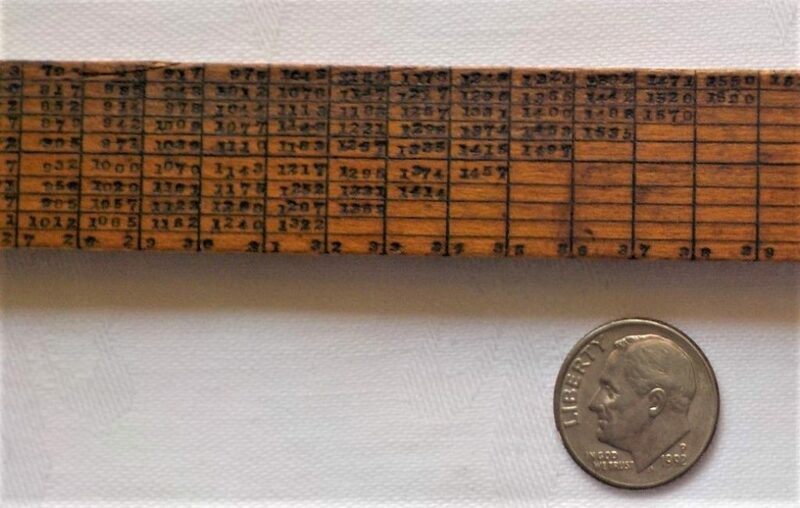 Brian Lants of Purcellville, Virginia began collecting rules after he purchased an old two-foot four-fold rule while on vacation. His collecting initially focused on collecting all types of rules by American makers. He soon discovered that serious rule collectors are interested int eh best examples of the rules they collect, so competition for high quality rules is fierce. So, Brian focused his collection on rules made by the Kerby & Bros. Rule Makers of New York City. Brian’s display included 22 cordage rules (cordage refers to the ropes used as rigging in ships, or rope in general) produced by Kirby but imprinted with the names of different cordage manufacturers in the U.S. and Canada. Brian explained that, “Kerby was a specialty rule maker. I do not believe they ever published a rule catalog like many of the traditional rule makers. 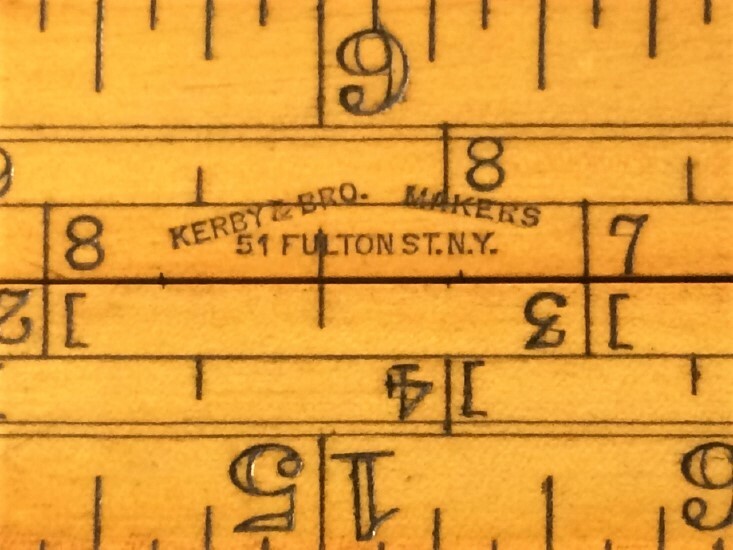 Many of the rules made by Kerby were custom orders often with special advertising, markings and scales. Kerby & Bros Rule makers was established in 1847 and remained family owned for three generations. The business finally ceased operation in 1953 after the death of Robert Kerby Jr. I’ve had multiple people tell me that when the shop closed, they put all of the contents out on the sidewalk in front of the shop for people to take. They produced rules for rope makers, printers, tailors, cobblers, glaziers, paper hangers, teachers pattern makers and many others. Every year when I think I’ve seen them all. I find something new that I’ve never seen before. 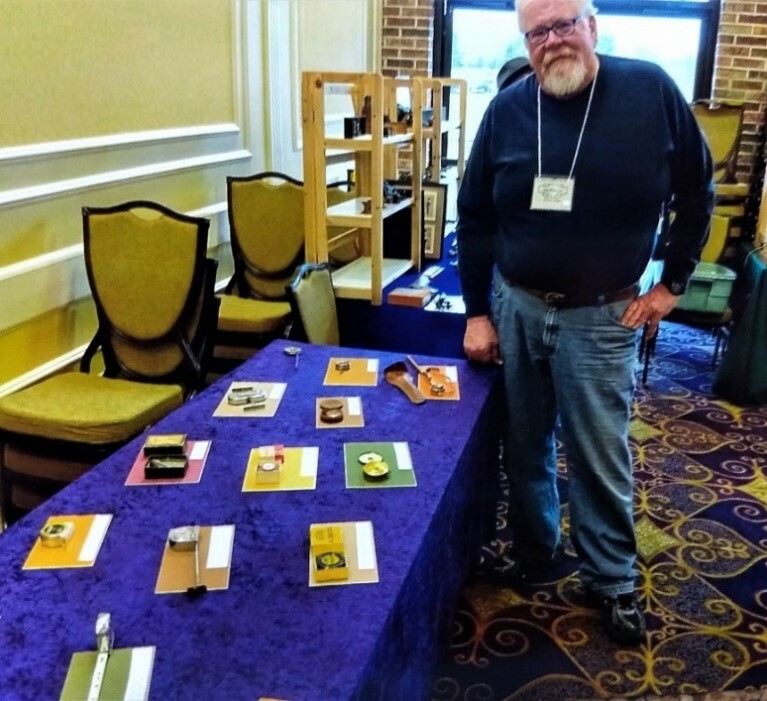 Brian has well over 100 Kerby rules in his collection ranging from rope gauges to a six-foot long baggage measuring caliper that was used on the S.S. Roosevelt steam ship. For the past four decades, George Gray of Nashua, New Hampshire has collected a wide variety of both American and English rules. 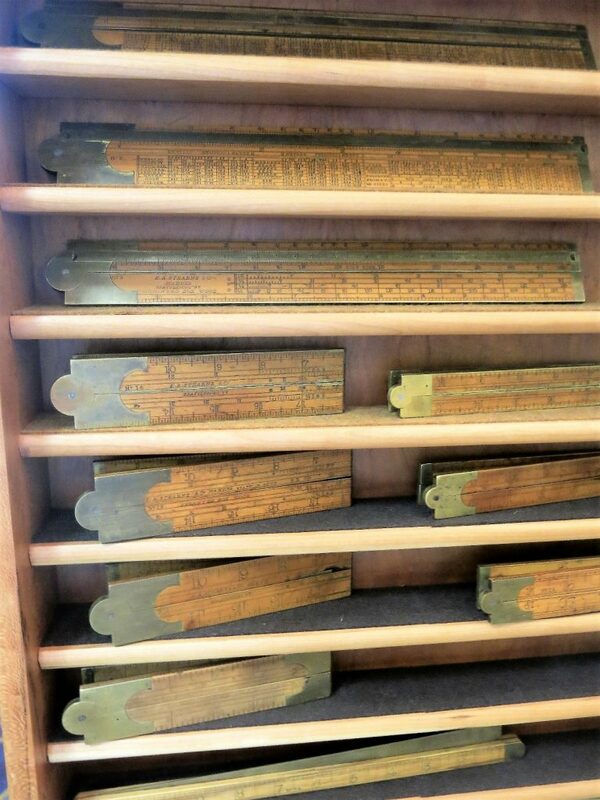 His display featured examples of American and English engineer’s rules made of boxwood and brass with double slides. The earliest rule in his display was a Wood & Lort of Birmingham, England c. 1750 engineer’s rule names, “The New Improved Sliding Rule.” This rule has dual adjacent Gunther brass slides. 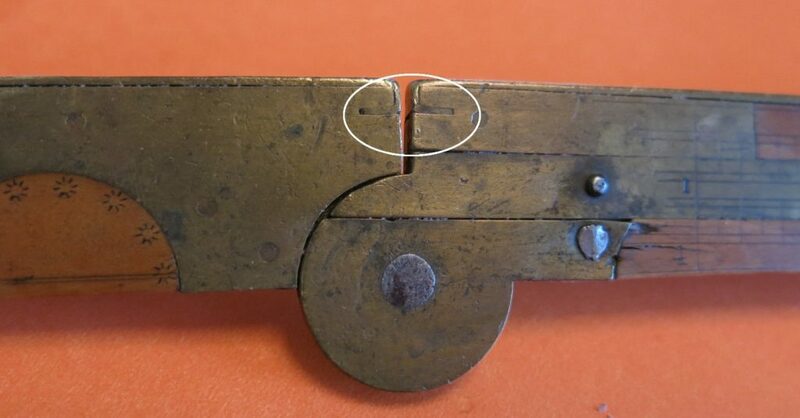 George also had an A. James Nobel of Sheffield, England two-foot two-fold engineer’s rule, c. 1870 with duel brass Gunther slides, one with “English” graduations, and the other in “Metric”. American rule makers were represented by two Stanley Rule & Level Company two-foot two-fold engineer’s each with dual brass extension slides. An S.A. Jones, Hartford, CT two-foot four-fold rule and an H. Chapin two-foot four-fold rules were also in his display. Both of these rules had split two cycle brass extension slides. But George considers the Geo. Curtis Improved Engineer’s Rule manufactured by E.A. Stearns in Brattleboro, VT, to be the most interesting (See Figures 18 and 19). “There is documentation on how the rule is to be used. It describes the use of the “Plain Scale” and the “Diagonal Scales” on the rule. On the reserve side of the rule are dual Gunther slides made of boxwood, one on each leg.” Gorge continues to research the rules in his collection. He finds wantage and engineering rules very interesting because of the complexity of the scales and tables. His reward is in being able to decipher the rule maker’s intentions. 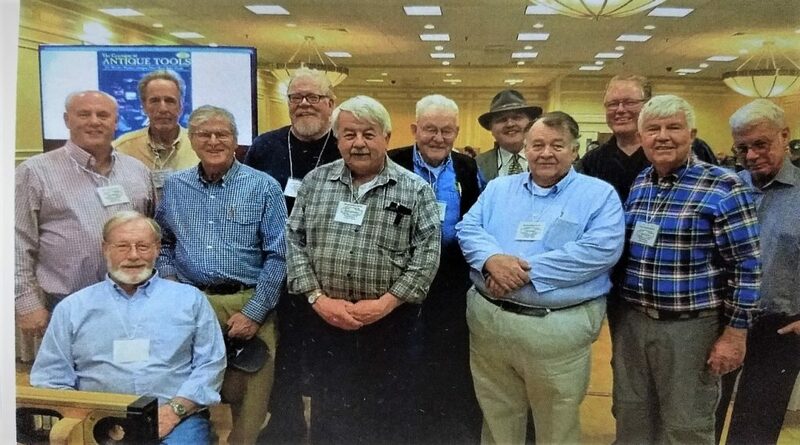 Cheers to the Rule Collectors for taking the time to exhibit and discuss their rule collections, thanks. Well done Tom Whalen!